Congratulations, your chicks have made it to the transition stage! A few weeks have passed since you brought those little balls of fluff home, and it’s time to formulate a plan on housing, because your flourishing chicks will soon outgrow that brooder. Here are a few tips on transitioning to the coop, and feeding recommendations as your babies grow into healthy adult birds. • Chicks should be mostly feathered – At 5 to 6 weeks your fluffy chicks will start to resemble adult birds by growing out pinfeathers. These adult feathers will help them regulate their body temperature better than fluffy chick down. • Chicks should be acclimated – Although they start off at 90 – 95 degrees in the brooder the first week of life, you need to decrease this temperature each week until the temperature inside the brooder is close to what daytime temps will be. For the first few weeks (and especially if outdoor temperatures are fluctuating), you may want to bring the birds back into the brooder at night or in bad weather. 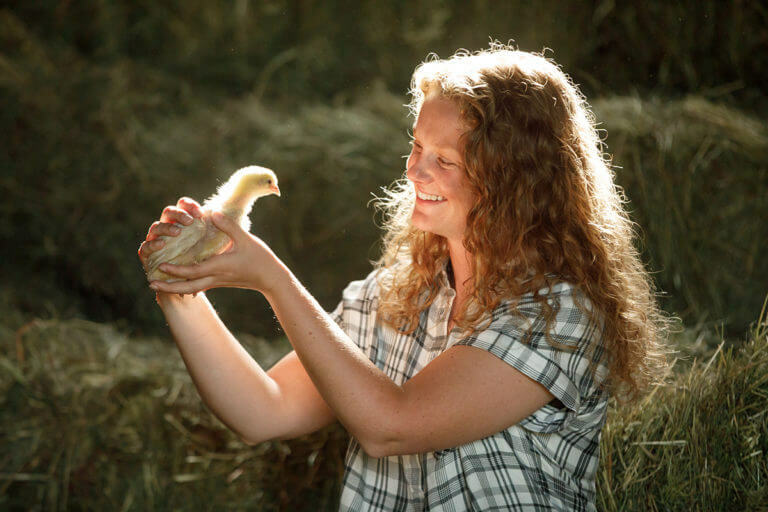 • Chicks should be integrated – Nobody wants hen-house drama, and taking a few simple steps to introduce new birds to old will save a great deal of time and potential injuries. • These steps include having a “get acquainted” phase when the new and old birds are in separate, but attached areas so they can interact without aggressiveness. • You also want to do the coop consolidation at night so that the old and new flock wake up together, which can help minimize bullying. At this point it is also important to remember, if you have youngsters joining your existing flock, to only feed chick starter to all birds until the youngest bird is 16 weeks. The extra calcium in regular layer feed can harm young chicks. Once you’ve reached the 16 week mark, it is safe to switch to layer feed. Your girls will most likely not be laying until they are around 24-26 weeks old, but it is important to build up the calcium level in their system. Using a layer crumble makes the transition a little easier. Just remember, if you start feeding treats, you should offer no more than 10-15% of the total diet as treats, so that you don’t create nutritional imbalances in their overall intake. Also, you should offer grit free choice to aid in digestion.